John Broge has provided his share of excitement to local boating enthusiasts over the years, as well as donate his time and energy to numerous worthwhile causes. In many ways, his life has been formed out of the boat racing he loves so much. But to hear John tell his story, the boat racing community has given to him much more than he has contributed to it. Broge, born and bred in Wyandotte, became interested in anything with a motor early on. His Dad raced boats and some of Broge’s earliest memories are of watching his Dad compete in local races. Whether through genes, environment, or both, John started riding motor bikes, tinkering with anything mechanical, and eventually, climbing inside a boat. As a result of a great deal of hard work and sponsorship support, Broge was able to race on the American Power Boat Association outboard hydroplane circuit, where he excelled for several years becoming one of the top-rated racers in the country in the SST 120 racing class. Broge won the Trenton Roar on the River in 2005, and was hoping to get things back on track after a couple of rough outings in 2006. But on July 22, in the first heat of the 2006 120 competition, Broge’s boat flipped during a turn, causing spinal injuries that left him without movement in his legs and resulting in a more than two-month stay in the hospital. Broge’s sons, J.R. and Leland, have picked up the mantle and are now involved in racing, each in their own way. J.R., now 16, looks like he possesses his Dad’s talent for driving and with hard work, is becoming a really good driver in his own right. Leland, 13, has a bent towards the mechanical side and loves tinkering with engines. Their father could not be more proud and excited that they are carrying on the legacy that started with his father. Overcoming adversity is something Broge knows about firsthand. He believes the key factor that has allowed him to overcome in his journey has been a strong support system. 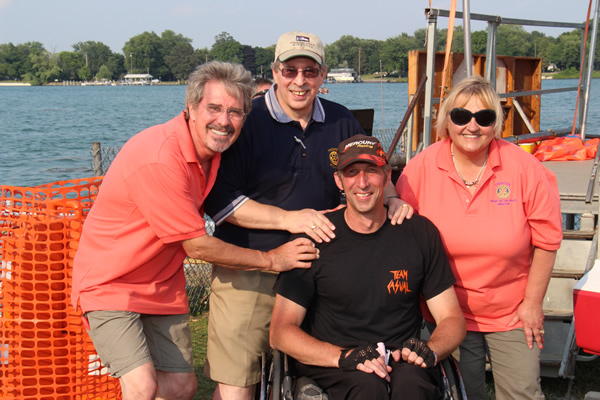 Sometimes people have family and friends that can help, but according to Broge, the best thing a person can do is to “get involved in something they are passionate about in order to create a support network.” In his case, it was the boat racing community, but each person should create their own community that will be there for them in times of need. His story is an inspiration to what can happen when an individual focuses on a passion, connects with others who have that same passion and is determined to never let that passion go. The entire weekend is FREE to all spectators. If you want to experience the “Taste of the Races” on Friday night, the tickets are $30 each or ten for $250.